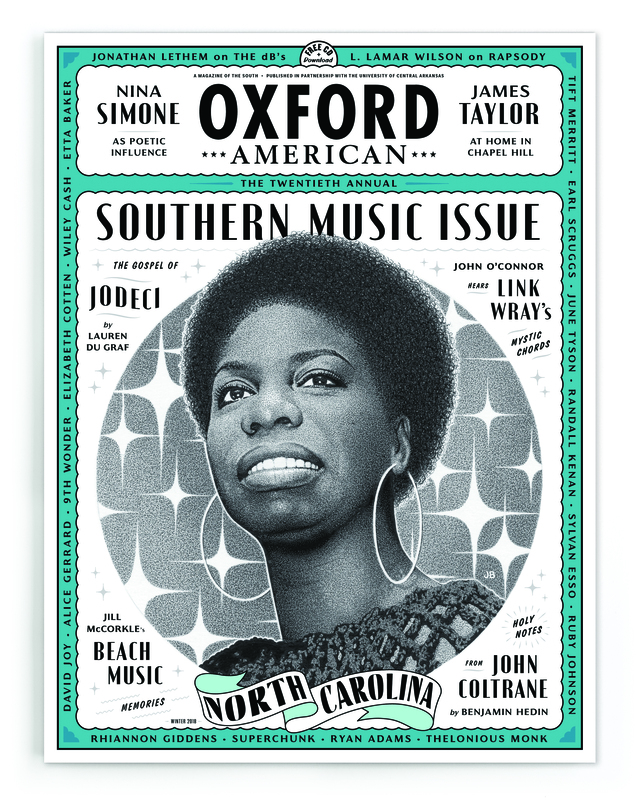 Raleigh, N.C. (November 1, 2018) — The Oxford American Magazine’s 20th annual Southern Music Issue celebrates the musical legacy of North Carolina and features an artistic portrait of North Carolina native Nina Simone, the High Priestess of Soul, by Jim Blanchard on the cover. Simone, born and raised in Tryon, N.C., is celebrated as an icon of American music in a feature essay about artistic influence and identity written by poet Tiana Clark. The North Carolina issue was made possible by the support of the North Carolina Department of Natural and Cultural Resources, the North Carolina Arts Council, Visit North Carolina, Arts Greensboro and the North Carolina Humanities Council. An essay on the state’s musical heritage written by Wayne Martin, executive director of the North Carolina Arts Council, is included in the issue as well as a map featuring North Carolina music trivia and illustrations of our iconic North Carolina musicians. Other featured authors include Benjamin Hedin examines the spiritual milieu of John Coltrane’s High Point upbringing; Lauren Du Graf unpacks the gospel roots of Charlotte’s R&B superstars Jodeci; L. Lamar Wilson spends a day with Rapsody in the rapper’s hometown of Snow Hill; and Will Blythe pays tribute to fellow Chapel Hill-native James Taylor. Also, Lumbee historian Malinda Maynor Lowery recounts her parents’ baptisms in Robeson County; Sarah Bryan chronicles the town of Kinston’s immense legacy; Lina María Ferreira Cabeza-Vanegas examines Charlotte’s Latinx music scene; and Oxford American deputy editor Maxwell George compares Ryan Adams and Thomas Wolfe. The issue also contains North Carolina poems by Benjamín Naka-Hasebe Kingsley, Nickole Brown, Tyree Daye, C. L. White, and Zachary Lunn. In addition to writing and music, the issue features photography and artworks by North Carolinians, including Romare Bearden, Minnie Evans, Sandlin Gaither, David Holt, Scott Hazard, and Hatty Ruth Miller. The CD sleeve art is by Charlotte-based muralist Nico Amortegui. The issue also includes a 24-song CD sampler of recordings from North Carolinians from 1924 to 2018, plus accompanying digital download with four bonus tracks) highlighting music from N.C. legends such as Simone, Thelonious Monk and John Coltrane, Earl Scruggs and Doc Watson, James Taylor and Elizabeth Cotten. This CD includes a new recording of Ella May Wiggins’s 1929 protest song “Mill Mother’s Lament” by Shannon Whitworth made exclusively for the Oxford American at the iconic Asheville studio Echo Mountain in September. Detailed liner notes and essays on the songs were written by Rhiannon Giddens, Wiley Cash, Ron Rash, Michael Parker, David Joy, David Menconi, and Randall Kenan, among others. Other literary luminaires from North Carolina contributed essays and profiles about music, including Jill McCorkle on Beach Music; Dasan Ahanu on 9th Wonder; Dave Tompkins on George Clinton and Abigail Covington on Liquid Pleasure. -Daily posts of North Carolina multimedia music stories at ComeHearNC.com. -Exclusive monthly live streams of performances. -Commissioned North Carolina artist pairings. -Curated “Tiny” concert films. North Carolina musician stages at MerleFest, Wide Open Bluegrass, NC Folk Festival, and other major festivals around the state. Born Eunice Kathleen Wayman in Tryon (Polk County), her range of material included jazz, spirituals, folk songs, blues, pop and classical. The nation’s first African American concert pianist, Simone died at age 70 in 2003 after a long career that made her a soul legend and civil rights icon. In June 2018, the childhood home of Nina Simone in Tryon was designated a National Treasure by the National Trust for Historic Preservation. Four African American artists joined forces to purchase the house in order to preserve Simone’s legacy. The artists included conceptual artist Adam Pendleton, sculptor and painter Rashid Johnson, collagist and filmmaker Ellen Gallagher and abstract painter Julie Mehretu. The purchase caught the interest of the National Trust, which had recently started a $25 million campaign to preserve historical sites related to African-American history. The state’s African American Heritage Commission is working with state and national partners to create awareness about the home through various fundraising efforts. Much of Simone’s best-remembered songs. Including “To Be Young, Gifted and Black” and “Blackash Blues” were civil rights anthems on topics ranging from the condemnation of Jim Crow laws to addressing the assassination of Medgar Evers and the 16th Street Baptist Church bombing in Alabama. To order copies of the Oxford American North Carolina Music issue and CD sampler click here.